"I love this recipe because it is so easy to make and filling. If doing a low-carb diet you can eliminate the potato. I have also substituted the asparagus with broccoli and/or spinach." Place the potatoes into a small pot with enough water to cover; bring to a boil, then reduce heat to medium-low, place a cover on the pot, and simmer until tender, about 20 minutes. Drain the potatoes and transfer to a bowl; add the sour cream and mash lightly; scrape into the bowl of a blender. Cut asparagus into 3 parts: woody ends, tips, and center pieces. Combine the woody ends of the asparagus with the vegetable broth in a stockpot; bring to a boil and cook until the woody ends are tender. Remove woody ends with a slotted spoon and discard. 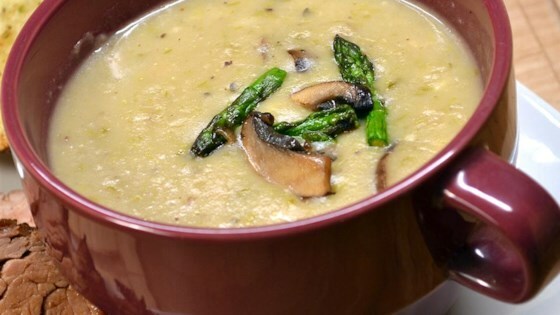 Remove 2 tablespoons broth to a bowl with the asparagus tips. Transfer remainder of stock to blender with the potatoes. Chop the middle segments of the asparagus. Heat olive oil in a skillet over low-heat; cook and stir the chopped asparagus, chopped onion, and 2 crushed cloves garlic in the hot oil until the asparagus is tender, about 10 minutes. Add to the broth in the blender, reserving oil in the skillet. Blend the mixture in the blender on high until smooth and creamy; return to the stockpot. Cook and stir the sliced mushrooms and 1 crushed garlic clove in the remaining oil over medium-low heat until the mushrooms soften, 3 to 5 minutes. Add the white wine; cook another 1 to 2 minutes. Stir the mushroom mixture into the soup. Heat the asparagus tips and broth in the microwave for 2 minutes; stir into the soup. Season the soup with cayenne pepper, salt, and black pepper. Very flavorful and not too rich. I substituted Fage non-fat greek yogurt for the sour cream which was great. I used bone broth and chicken broth for the liquid, otherwise followed the recipe. My family loved this soup. It was really good. I made it according to the recipe and everyone loved it.